Since foldable devices seem to be the next big leap in smartphone design, it is hardly surprising to see the world’s number three smartphone manufacturer teaming up with a Chinese display maker BOE. According to the South Korean media outlet ETNews, Huawei and BOE are working on a foldable smartphone project. If you’re not familiar with BOE, the display manufacturer and Apple might become partners in the future when the latter requires OLED screens for its future iPhone models. With the partnership of BOE and these OEMs, ETNews has reported that there are going to be at least 4 foldable smartphones being released. It is not known yet if Huawei has more than one folding devices in the pipeline. BOE is also reportedly working with LG that has patented many foldable handset designs recently. CEO of the consumer electronics business group of Huawei, Richard Yu, has previously mentioned that the company has been experimenting with similar devices for several years. According to some rumors, the company may launch a foldable smartphone as early as the last quarter of 2018. 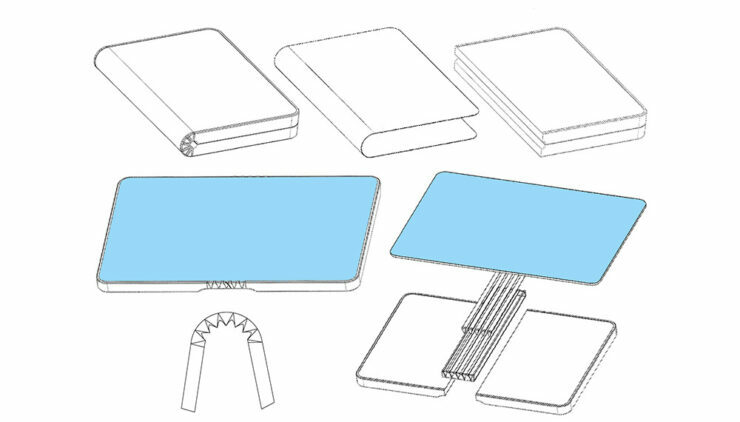 The company’s foldable device may feature the same hinge-based design that ZTE came out with last year with the Axon M.
Even Mr. Yu had mentioned previously that one of the prototypes that Huawei developed was similar to the Axon M. However, the company decided against it as it wanted to make the breaking line between the two displays smaller when the handset is in a folded-out state. OPPO and Xiaomi have also allegedly been working on a foldable handset so they could be the other two rumored team members that have partnered with BOE. Samsung is also expected to release its foldable smartphone in the first half of the next year because the Galaxy S10 is said to be released earlier in 2019. According to some rumors, the device would be called Galaxy X. BOE displayed a 7.56-inch bendable tablet and a 5.99-inch foldable handset at the SID Display trade show that was held in Los Angeles this week. It featured WQHD AMOLED panel that can be folded nearly 100,000 times before showing any signs of material degradation. Perhaps this is the prototype that Huawei might want as the final product when it is rumored to be released this year.